A dog whose photo touched the hearts of millions celebrated his twentieth birthday over the weekend. 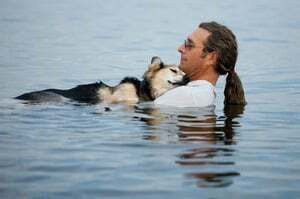 Dogtime.com first told you about Bayfield County, Wis., resident John Unger and his beloved old dog Schoep back in August of 2012. Wanting to pay tribute to his then 19-year-old severely arthritic dog, Unger asked friend and professional photographer Hannah Stonehouse Hudson to come along and take some shots while Unger and Schoep took a dip in the warm and soothing late summer waters of Lake Superior. A now-famous photo captured that day became an instant viral sensation. Just over a month after the photo was posted online, messages of love and monetary donations poured in, and Unger was able to get his four-legged best friend the arthritis treatments the old dog so desperately needed. Thanks to the kindness of people all over the world and some effective laser therapy treatments, Schoep’s condition improved dramatically, as did his quality of life. Today, more than 130,000 people continue to follow Schoep’s inspiring story on his official Facebook page, where Unger posts frequent updates and new photos documenting the life of one very exceptional dog. June 15 marked a huge milestone for Schoep and his proud papa when Schoep, whose arthritis had once threatened to sideline the aging pooch for good, turned the big 2-0. Twenty years is a long life for a dog, and Unger says he wanted to have a quiet, relaxing celebration fitting for such an extraordinary friend. Unger purchased a fresh whitefish filet from a nearby fishery and a scoop of vanilla ice cream for Schoep to enjoy on his special day. Thousands of Schoep fans sent along birthday cards and gifts for their favorite northern Wisconsin celebrity on four legs. One fan even sent a custom watercolor of Schoep painted from one of the dog’s many Facebook photos. Unger hopes he and Schoep can take another dip in Lake Superior soon in honor of their two happy decades together. “It’s pretty darn cold right now, but I sure would love to do it for him,” Unger says.